sharing why gay guys make the best dates for Valentine's Day. Humane Society of the United States. For more, visit his website, or friend him on Facebook or Twitter. My partner, Gary, and I keep two separate calendars, one work and one social. Our social calendar is filled with dates with our many “gurlfriends,” our besties who want to spend QT with us to try a new coffee spot, hip restaurant, or simply dish. “We wish our husbands were more like you!” our gurls often lament sometime in the course of our date. That got me thinking as we approach Valentine’s Day: Do gay boys (“GBs” in future references) make better dates? Would you rather spend a night with your husband or your gusband (gay husband)? Is our great date history myth or reality? I left our brotherly beer bash totally confused, kind of like when I see a Coen Brothers movie. Despite all the planning, the evening unfolded awkwardly, like a cheap card table. Although the restaurant was romantic, I acted like Clint Eastwood all night. There were awkward pauses in the conversation, and none of the spark that accompanied our time together. Still, when the waiter brought over the dessert cart, with my gift, as instructed, already positioned in the middle of the tarts and brulees, Gary gasped. What amazing gift had this amazing man purchased for his sweetheart? Suddenly, I felt this overwhelming pressure – like the emergency door on a plane had suddenly been thrown open mid-flight over the Atlantic. Gary furiously untied my bow and unwrapped the tissue paper – dotted with hearts. And then he pulled out a three-pack of Hane’s underwear. He yanked a sticker off the plastic bag. I had forgotten to remove the price tag. And then he left. To a smattering of applause. What had gone so wrong, despite, of course, the Hane’s horror, I fumed in my head as we drove silently home. The next morning, I met one of my best girl friends for coffee and talked about our Valentine’s dinners, which had unfolded, eerily, the same. “You know it’s not really about the gift, Wade,” she said to me. romantic. I was acting like my dad, who often got my mother a trash compactor or dishwasher for her birthday or Christmas. I don’t mean to stereotype men – gay or straight – but there are some commonalities that unite most straight males: They often don’t enjoy intimate conversations. They can be bad sharers. Some don’t love to dance, laugh, and compliment as much as the GBs. Most gay men, on the other hand, listen. Intently. We offer advice. We are romantic. We are fun. We compliment. And when we do, we mean it. Wear a great pair of heels, and we’ll notice. Trying a new lipstick color? We’ll gush. Why? We pay attention. The reason is that we don’t take anything for granted. We celebrate life. Oftentimes, it’s because many of us went through difficult times in our lives: We were worried we might not make friends, or we were fearful our families might turn their backs on us. Most of us fought like heck to find partners with whom to share our lives. Thus, we give back to those who love us unconditionally – friends, family, partners – a torrent of spirit, a heaping dose of our unfiltered, unedited selves.I believe we do make better dates, if for any other reason than that we realize life is short and can often be very difficult, so we need to celebrate – in a big way – with those we love. For lack of a better phrase: Life is too rich to go cheap, to be all Hane’s. that – even in a recession – the average man will spend over $135 on gifts for his sweetheart, tell your husbands to act a little more like your gusbands. Tell them it’s OK to be romantic, to celebrate you, to talk, and laugh. Tell them it’s OK to gush, to compliment, and to cherish your alone time together. If they do, congratulations. If they don’t, be honest. Go ahead, of course, and enjoy your Valentine’s gifts. I mean, I went ahead and bought Gary a trip to the Caribbean to make up for my Hane’s hell. And then, the next day call your gusband for lunch and tell him how it went. And if you don’t have a gusband, email me or Gary, and we’ll share an e-date to remember. 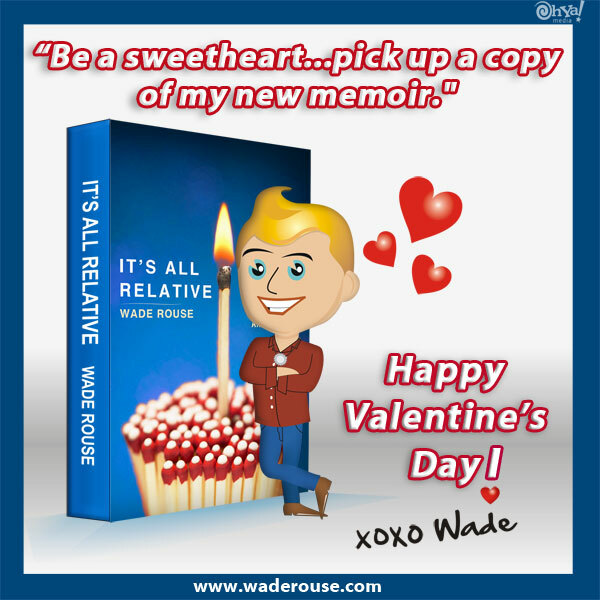 A special Valentine's thanks to Chick Lit Central and Happy Valentine's Day To All!